Black Friday = 10 % discount. All the way through to Monday! The longest Friday of 2018 is here – in our e-shop, Black Friday and our 10 % discount lasts all the way through to Monday 26 November. What surprises do we have in store for you? Lenses, solutions, cases, eye drops – save 10% on everything you need for contact lens wear. The bigger your order, the more you save. We have goods on offer that we don’t usually discount. Black Friday also applies to selected brands of sunglasses– Arnette, Carrera, Meller, Polaroid, Vogue. This special offer is valid until 26 November. 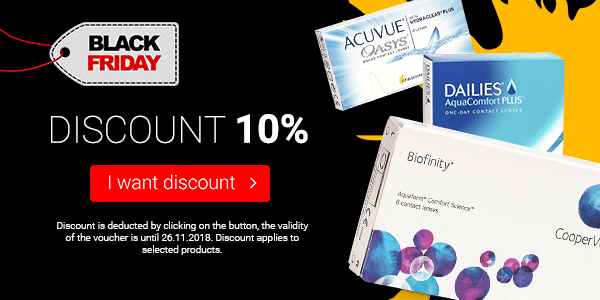 The 10% discount applies to all contact lenses and accessories and to selected brands of sunglasses.